Rally against Political Corruption In Slovakia: People At Home Have No More Bananas (money) For Gorillas (corrupted politicians), originally uploaded by infomatique. Protest Rally on O'Connell Street. 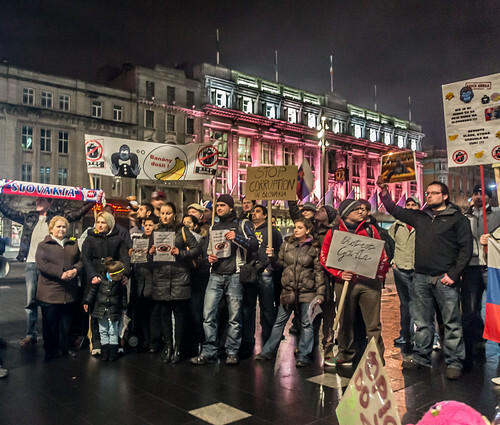 Protests have taken place in Slovakia (and in Dublin) over a scandal sparked by an online document. With parliamentary elections scheduled for March, the publication of the purported intelligence file codenamed ‘Gorila’ (gorilla) has provoked outcry, as it links leading political party members to collusion with financiers in privatisation and procurement.